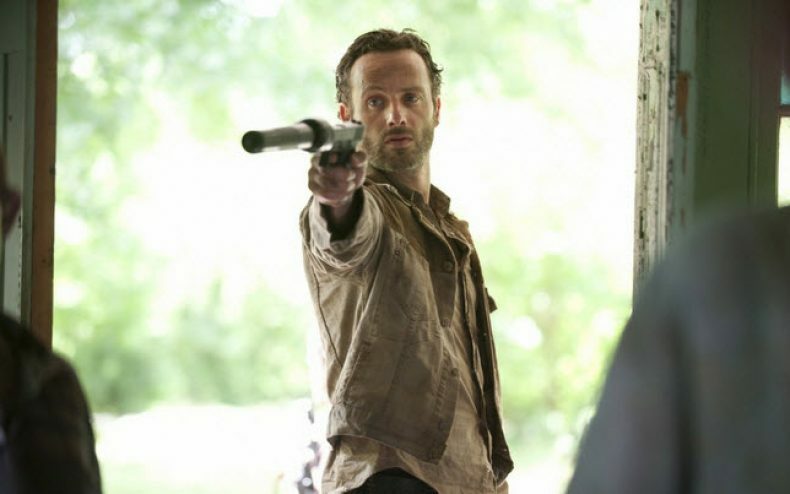 There is a new photo that AMC has released that shows Rick Grimes pointing a handgun that is equipped with a silencer. Besides the new photo of Rick, AMC has announced that the first full weekend of July (7th & 8th) will be all about The Walking Dead. AMC announced that this weekend will be a ‘preview’ weekend for the upcoming season. Spreading through the whole weekend will be both Season 1 & 2 followed by a Talking Dead special on Sunday, July 8th at 9pm. Following the Talking Dead there will be something new, an original pilot in black and white at 10pm. Before each episode starts Chris Hardwick (presenter of Talking Dead) will announce the next episode live from the season 3 set in Atlanta, GA. Also during that weekend there will be interviews with the cast and team of The Walking Dead. If your a fan of The Walking Dead, you don’t want to miss it! If you want more information on what’s happening until Season 3 starts then make sure you watch The Walking Dead Forums Blog. The Walking Dead returns in the fall on AMC (US) and FX (UK). THIS IS AWESOME! so excited to see the preview and can’t wait for walking dead to be back on I’ve prepared my whole life for a zombie happening, and I just love this f**king show! it’s the best there is EVER!